Nearer, my Grisham, to thee, nearer to thee. With The Judge, ’90s nostalgia—a force that will not stop until the rivers run sickly green with Surge—finally breaches the best-fortified stronghold of middlebrow culture: the mid-budget ensemble flick. Styled as a throwback to the leather-upholstered courtroom thrillers of the Clinton era, the movie casts Robert Downey Jr. as Hank Palmer, a slick Chicago lawyer who returns to his Indiana hometown for his mother’s funeral and then finds himself trying to defend his semi-estranged father, Judge Joseph Palmer (Robert Duvall), against a murder charge. Trying is the operative word here, because Judge Palmer makes no secret of the fact that he’d rather Hank hop on back to the big city, and foregoes his son’s pro bono counsel in favor of hiring an inexperienced local attorney, C.P. (Dax Shepard), who practices out of the back of an antiques store. In essence, The Judge is a combination of two very heavily codified genres: the Grisham-esque legal drama, with its lawyers divided by idealism and profit, and the small-town homecoming movie, with its assorted could-have-beens and ones that got away. Hank—who’s preparing for a messy divorce and custody battle back home—finds himself rekindling a romance with Samantha (Vera Farmiga), the high-school girlfriend he abandoned two decades earlier. There is the familiar equation of the hometown with a perpetually frozen past, with every character stuck in some kind of stasis: father and son unwilling to let bygones be bygones; Samantha, still working at the same diner; local criminals still harboring grudges against the judge for convicting them; Hank’s older brother, Glen (Vincent D’Onofrio), still living in the aftermath of an injury that cost him a pro baseball career; intellectually disabled younger brother, Dale (Jeremy Strong)—embarrassingly played for bathos and comic relief—and his fixation on re-editing and watching 16 mm home movies of their happy childhood. Home never changes; neither, apparently, do movies about homecomings. The problem with this kind of over-familiar material—which trades in popular stereotypes about small-town life, inept local cops and all—is that it can’t help but seem inauthentic and unspecific. (It doesn’t help that some of the regional details—like the idea that Northwestern grad Hank has never heard of C.P.’s alma mater, Valparaiso—are just plain wrong.) The movie’s fuzzy, clouded 35 mm textures and severely diffused lighting, which come courtesy of cinematographer Janusz Kaminski, are handsome, but they never seem anything more than artificial. One can almost hear the put-put-put of the smoke machine, just out of frame, when Hank sits down with the judge in his home office. And yet the movie isn’t without its pleasures, most of them related to performance. Farmiga, a perennially underrated actor, gives Samantha a measured confidence that sets Hank’s manic cockiness on edge, and Billy Bob Thornton does an effective variation on a slimy archetype as the prosecutor, Dwight Dickham. This is, however, Duvall and Downey’s movie to carry. 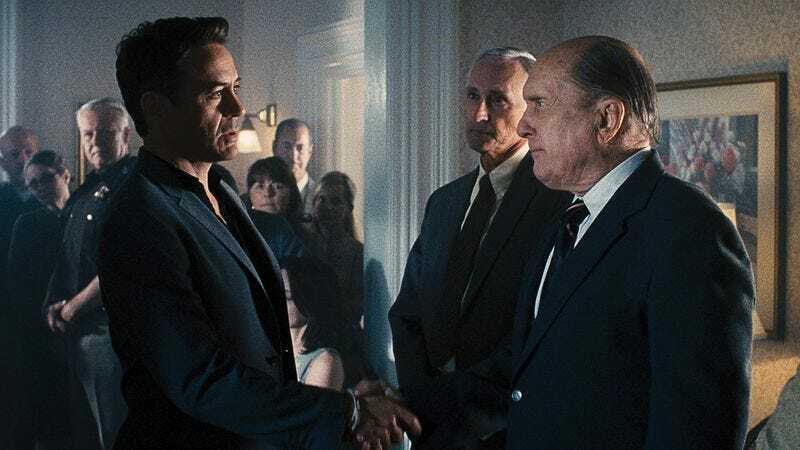 For the most part, both actors are doing shtick—Downey as the sarcastic and self-aware charmer, Duvall as the straight-talking, but emotionally distant, old codger—but it’s so well developed, with both making the most of their signature cadences, that it rarely matters. Sometimes, as in a scene where Hank finds his father collapsed in the bathroom, they even get to act.